So scarifying was our last visit to Yim Yam in Yarraville that it has taken more than five years to return. On that occasion, on a busy Friday night, the place was uncomfortably cramped and the staff seemed harried to distraction. At that time, a much younger Bennie was very much unused to spicy food, so we made a point of choosing one dish by adhering to the restaurant’s chilli grading system. But our “one chilli” choice was so unbearably hot that even I could eat only a few mouthfuls. When I tried to raise this matter with the staff member who seemed to be in charge, I was blown off with a dismissive wave of the hand. It was a long time ago – and certainly before the arrival of Consider The Sauce. But, yes, it has remained in memory a vivid experience for both of us. Returning for a mid-week dinner, we find much – perhaps even everything – has changed. The place has expanded, with a lovely dining room now adjoining the original, smaller eating and kitchen space. The staff are happy, obliging and on the ball. With this sense of expansiveness, what might have previously been viewed as an imposition – being seated at the window bench right next to the door – is just fine by us. We navigate a dauntingly long menu of dishes mostly unfamiliar to use with aplomb, ending up with just the sort of meal we desired, even if our picks are a little on the unadventurous side. Even better, by going without our usual soft drinks and appetisers of the snacky variety, the bill clocks in at just a tick over $40, which we hold to be excellent value considering the quality of the food. 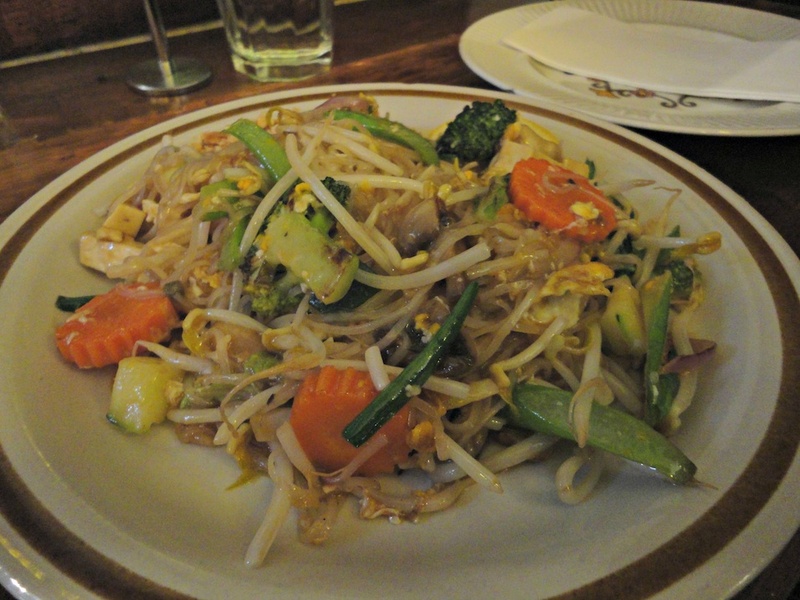 Vegetarian pad thai ($12.90) is a fine foundation for our dinner. It’s quite wet and mildly spiced, yet has a good lemony tang and a profusion of lovely vegetables, sprouts and tofu. 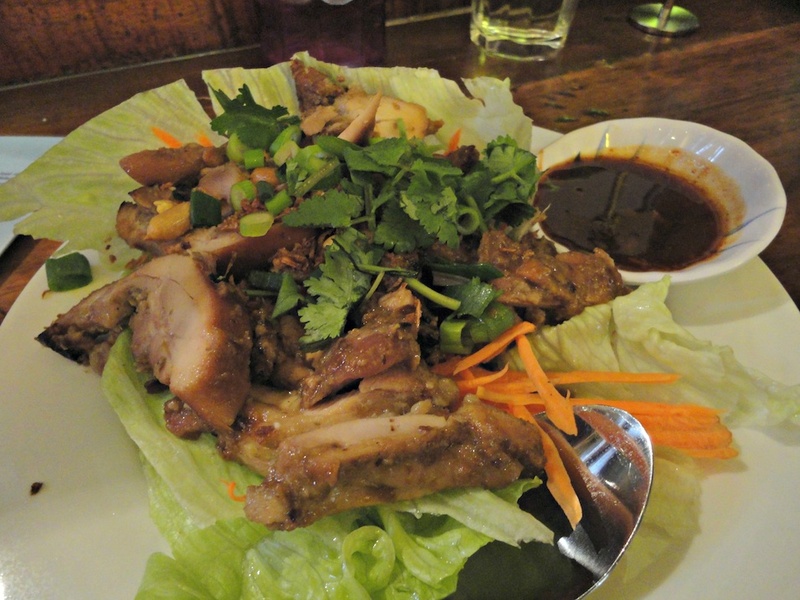 Vientiane salad ($12.90) is Bennie’s choice and it’s a good one. This one, too, has a bold lemon quotient, but we pretty much inhale the “white noodles with shredded green papaya, tomato, peanuts and herbs with a lemon flavoured dressing”. Our protein hit comes courtesy of guy yang gup jaow mark kham – “marinated grilled chicken with chilli tamarind dip” ($15.90). It’s good but doesn’t transport us to delight as our previous, vegetable-based choices did. That’s down to the chicken being a little on the bland side and also being very like the Vietnamese grilled chook we’ve eaten so often. The sticky tamarind chilli sauce is terrific, though. If anything, the best part of this dish is scooping up the mess of carrots, coriander, spring onion and peanuts imbued with the chicken/marinade cooking juices. Tonight’s Yarraville adventure has come about because I’d had quite enough of driving for the day, so somewhere, anywhere in our immediate backyard has been the go. Walking around Anderson and Ballarat streets leads us to acknowledge just how many Yarraville village eateries we have yet to visit and/or write about, even if quite a few of them fall into the “special occasion” category for us. Still, it’s been a happy outing in that we’ll be more than glad to return to Yim Yam where previously we have stayed away. Oooh, you have me salivating. I absolutely love Yim Yam, but it’s so hard to get in and my kids won’t eat it! It should be called Yum Yum! Wow, makes me oh so grateful for where Bennie is at and where he’s going. For this meal, he was much more interested in scoping out the salad/vego options, and in eating them, leaving the meat to me. I might be able to get the family back here based on these changes. 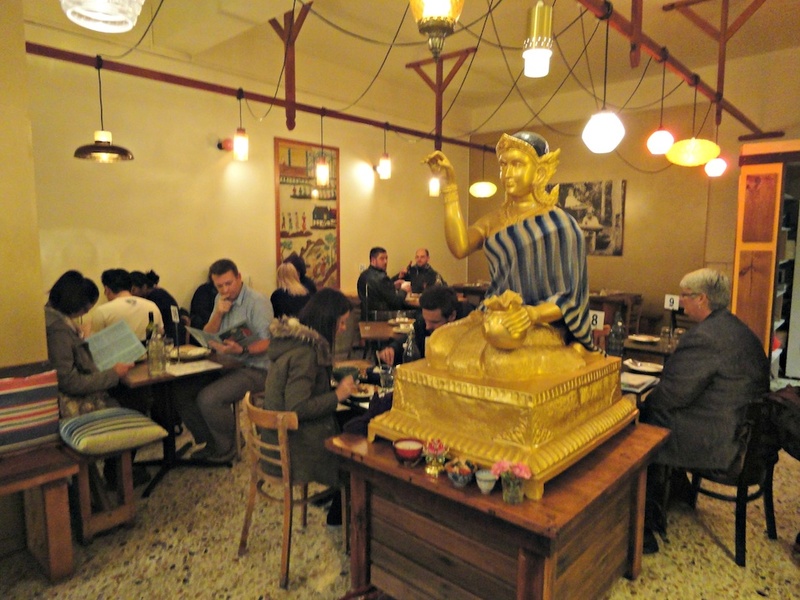 On my previous visit I thought the service was authentically random and chaotic for Laotian, but the khao niew serves were tiny. Most Lao meals come with a serve of rice as big as your head. Hi Bruce! Yes, it’s definitely better. Earlier in the week and/or booking probably advisable. We re-visited the Moonee Ponds branch recently and I have to say we were a little disappointed in the quality of the food. Although I always allow for the kitchen having “off” days. They’re only human after all. Hi Temasek! 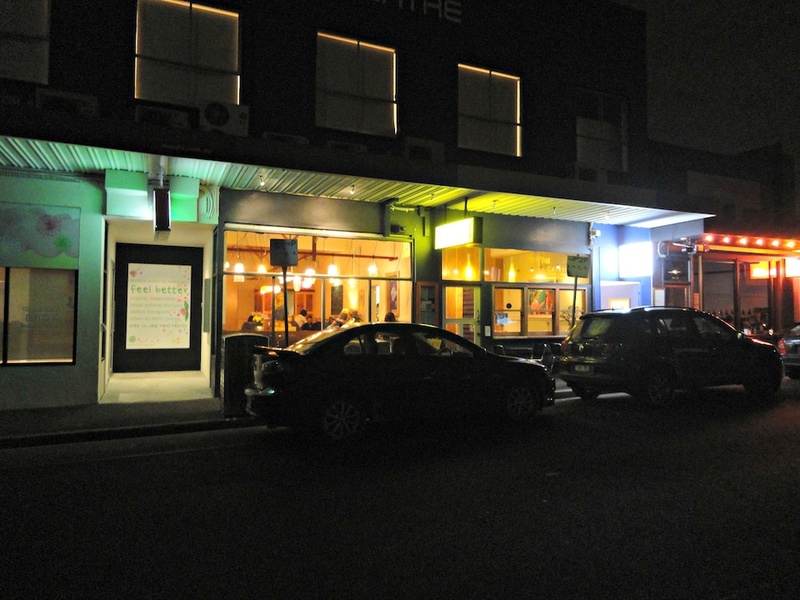 Yes, forgot to mention the Yarraville joint is part of a mini-empire! I love Yim Yam!! Pad Thai is my go to dish. I was disappointed once time though, when I ordered the seafood curry served in a coconut shell.. it didn’t look very appealing when it arrived!! Headed to Yim Yam a couple of Saturday nights back and it was stunning. The duck curry is great, fruity, ducky, rich and just enough. So happy they are doing great Lao again. Kenny, firstly I walked past you tonight but didn’t realise until we were too far away (how tall Ben has grown). Secondly, I ate at Yim Yam tonight after a very long hiatus. I have always loved the food but the service, both eat in and take away, has been horrendous. There was a young man working there tonight who needs to teach some of the older staff a thing or two. I’m guessing he was in his mid to late teens, but he was so considerate, so caring. And then older staff came up and were rude and stand offish. I love the food here but only go if friends want because of the horrendous service. The staff need to take note of this young man. He was outstanding. The food was, as usual, superb. Hi Pauline! Sorry to have missed you! Bennie will one day be taller than his dad – haha! Interesting about Yim Yam. 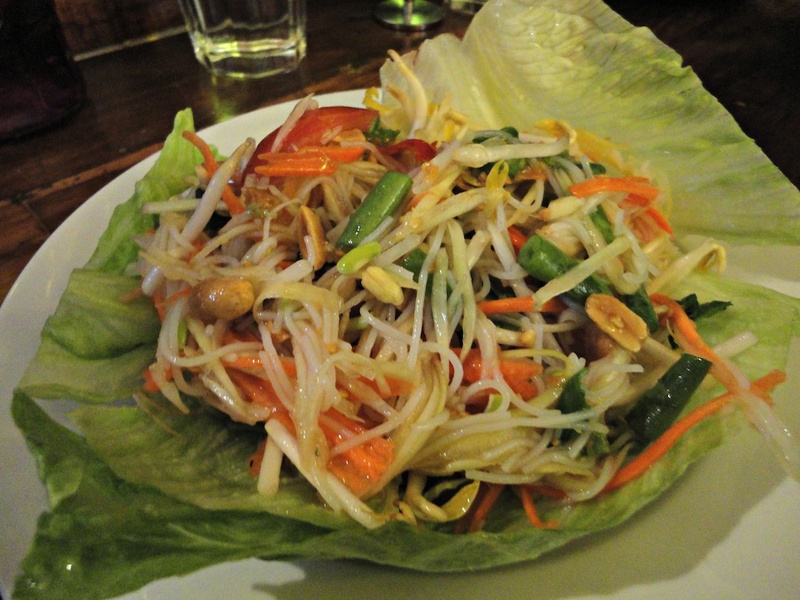 But our new fave is Issam Thai Street Food!